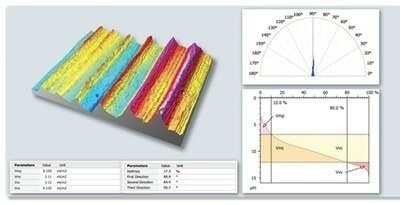 Bruker Corporation and Digital Surf today announced that Bruker Nano Surfaces is offering Vision64 Mapdata analysis and reporting software with its entire line of 3D optical microscope systems. Vision64 Mapis an extension to Bruker’s industry-leading Vision64® instrument control and analysis software, and is based on Digital Surf’s Mountains® Technology software platform. The new software opens up streamlined access to automated reporting of advanced surface measurements in 11 languages, while ensuring compatibility across a wide range of industry norms. Vision64 Map enables more comprehensive 3D surface visualization and analytical data with Bruker 3D optical microscope systems. A complete user workflow is now available, including automated data acquisition and advanced data analysis, followed by powerful data visualization and reporting. Multiple image enhancement tools provide best representation of detailed features of interest. The software is powerful enough to give power users access to advanced, very customizable functions, yet it is easy enough to use for production monitoring on manufacturing floors. For example, users can easily plot measurement results from a number of samples and set upper and lower critical limits for trending analysis and production control. The software also allows users to characterize surfaces in accordance with the latest metrology standards, including ISO, ASME B46.1, DIN, JIS, and their equivalents in other geographic regions of the world.